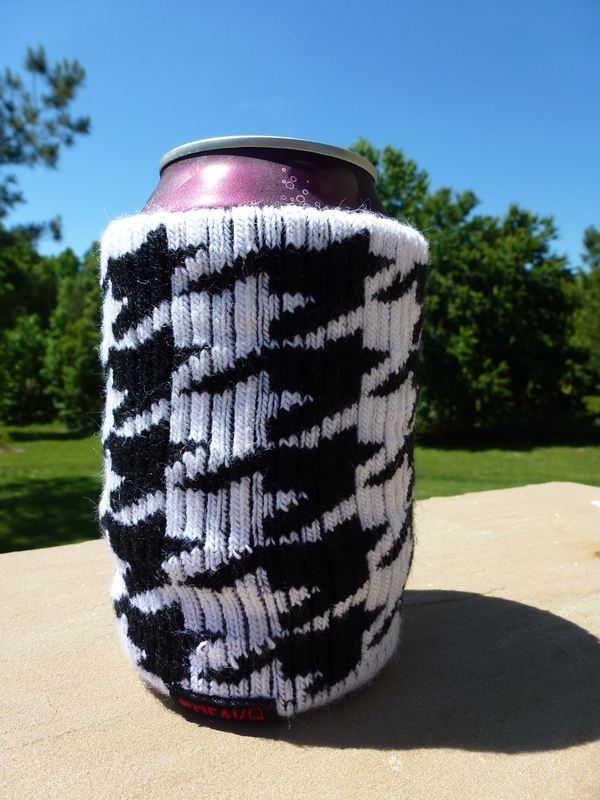 Freakers™ are strong knit koozies (machine washable) that can stretch to fit any size bottle. 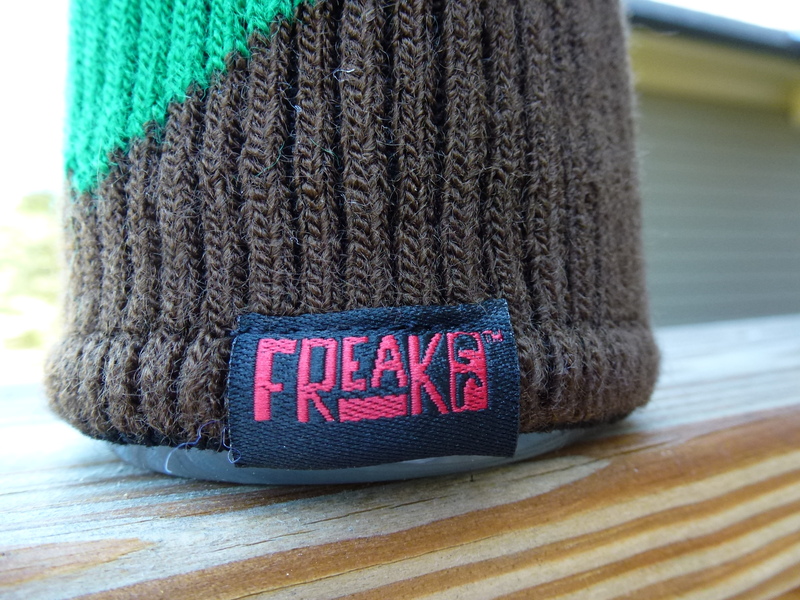 There are a lot of Freaker™ designs so you can pick one – or some- that suit your mood. 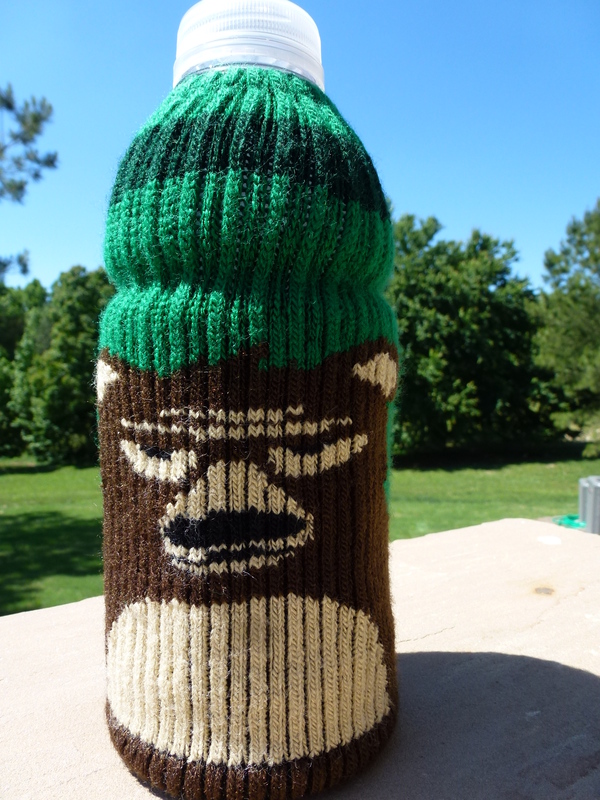 I found my drink sweaters to be a good insulator keeping my drink cold and my hands dry. 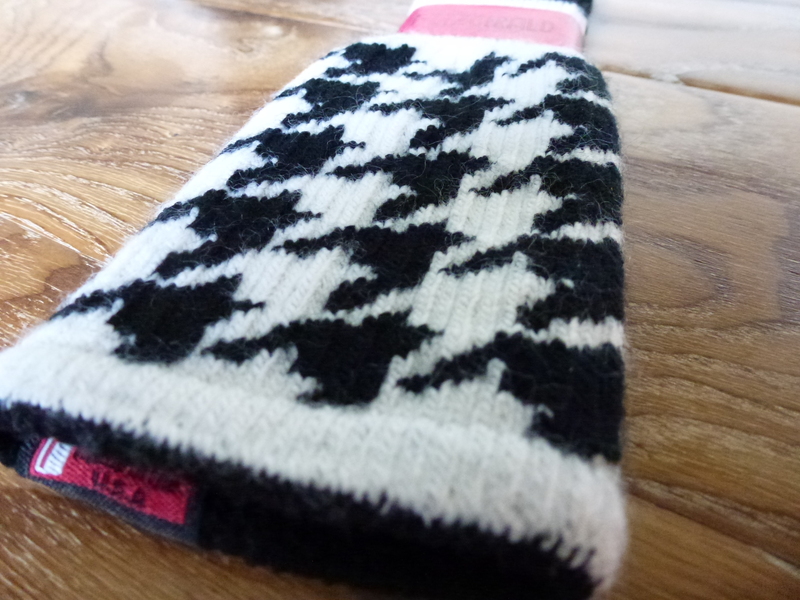 (can also keep your drink hot and your hands not) I like that they are fun and purposeful. And that they are made right here in NC. Making the world a better place through the power of selfies. 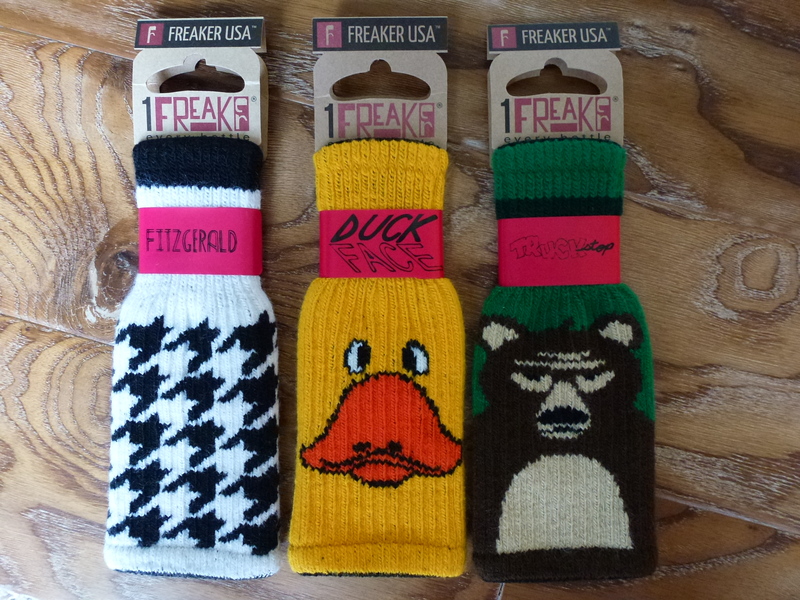 Notes From Dawn received the above Freakers™ from Freaker USA™ in exchange for an honest review. A positive review is not guaranteed, and all opinions are my own. No other compensation was received. Algonquin Young Readers is a new imprint that features books for readers seven to seventeen. From short illustrated novels for the youngest independent readers to timely and topical crossover young adult fiction, what ties our books together are unforgettable characters, absorbing stories, and superior writing. A captivating read for either middle school boys or girls (ages 8-12). Told from the alternating views of Anton and Cecil (cats), each chapter is illustrated with a black and white line drawing. Artistic talent done by Kelly Murphy. It was the cover artwork that piqued my interest in the book. Nicely done throughout. “Winning author Valerie Martin’s and Lisa Martin’s colorful cast of characters, rich historical detail, and lyrical storytelling will delight fans of such classic animal adventures as The Wind in the Willows, Stuart Little, and Poppy.” I love Stuart Little and also The Cricket In Times Square and in my opinion Anton and Cecil is a good story but doesn’t come close to a “classic” adventure. I rate the storytelling as fair but without flair. A copy was provided by Algonquin Young Readers at the request of Lisa Martin. No other compensation was received. All opinions are my own. Love expressed in words only can leave you feeling cold. Love expressed in deeds brings warmth and fulfillment. 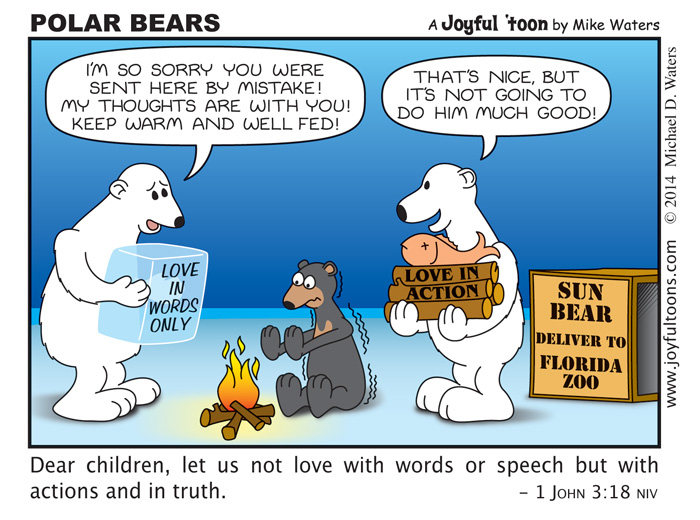 This Polar Bear Joyful ‘toon was created by Mike especially for my blog. Joyful ‘toons are posted on Notes From Dawn with permission from Mike Waters. Come take a fun visit to the Park with some happy, loveable little Pegs as they race and jump from hole to hole along the colorful tracks in the Park. If you beat the other Pegs to the Ice Cream Cart, you win! This fun, educational game will help kids learn plus(+) and minus(-), as well as help to develop small motor skills and eye-hand coordination. 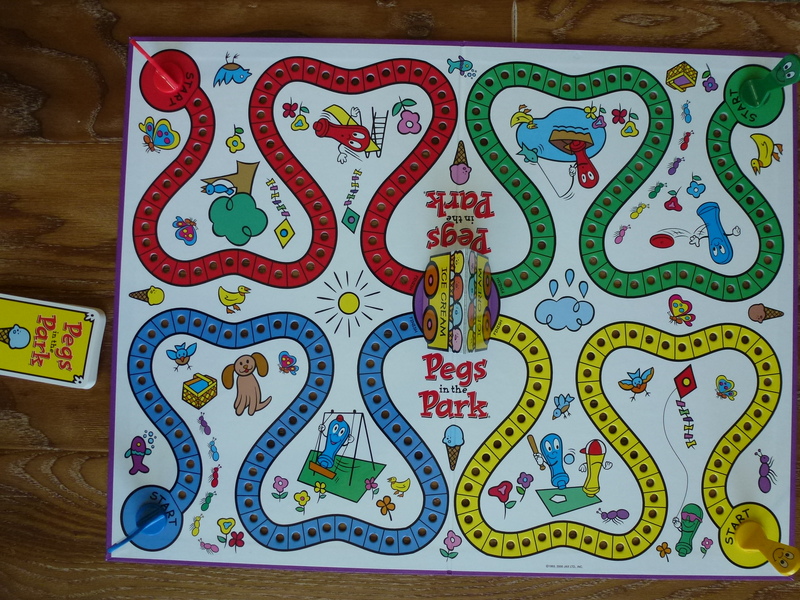 Now that the weather is cold, enjoy some time playing Pegs in the Park, a winning combination of fun and learning. Little kids (ages 4-8) navigate their peg through the park toward the ice cream cart. Teaches number recognition, counting, subtracting, & concepts of moving forward and backward. My recommendation for this game would be if the board was designed a little thicker and the pegs a little longer to make moving from hole to hole a little easier! I received Pegs in the Park from Jax to help facilitate the writing of an honest review. A positive review is not guaranteed, and all opinions are my own. No other compensation was received. The Numbers Game You Can COUNT On For Fun! Game contains cards, chips, and instructions. For 2 -4 players ages 7 and up. Rules declare first player to win three hands to be the game winner and chips are used to count a player’s wins. The game can, of course, be played hand by hand for a shorter game. Or to allow for multiple winners! 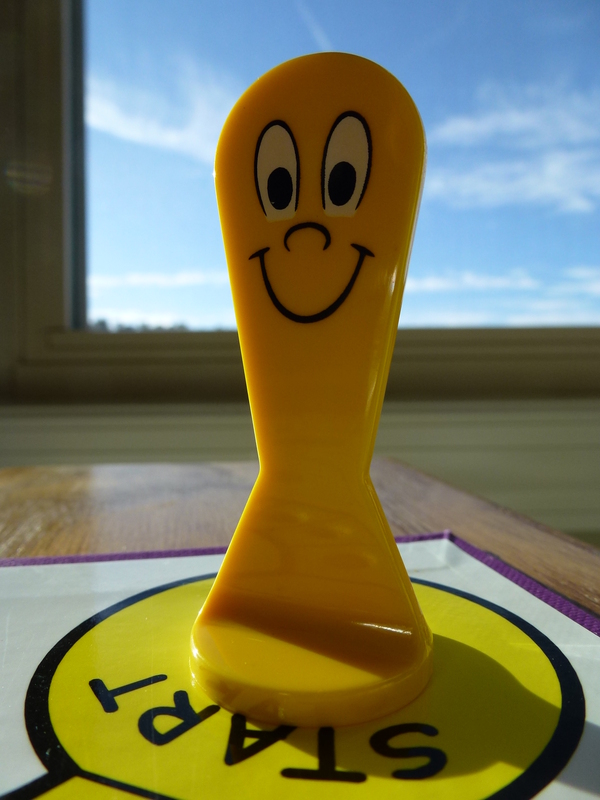 (that’s nice) It’s a simple game that’s small for travel and good for reinforcing addition skills. Also a good stocking stuffer! Complete instructions on the Jax website. Additional note: We also enjoyed playing Match ‘Em using subtraction to complete the match. I received Match ‘Em® from Jax to help facilitate the writing of an honest review. A positive review is not guaranteed, and all opinions are my own. No other compensation was received. Create a ‘doodle’ with a few rolls of the DOODLE DICE™. There’s a different doodle pictured on each card in the deck. When you build a doodle that matches one of the cards , you take that card. Block an opponent’s turn or take one of their cards away. Collect one card of each color and you win! 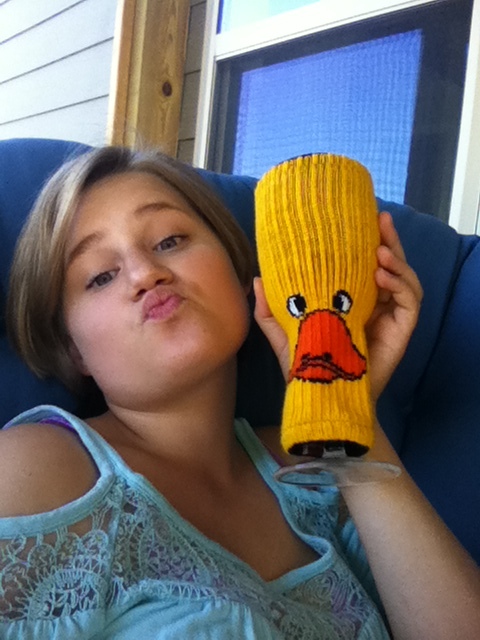 It’s the fun challenging way for everyone in your family to a be a ‘doodle artist’! Win Doodle Dice™ by being the first to get a card of each color. A different doodle is pictured on each card. 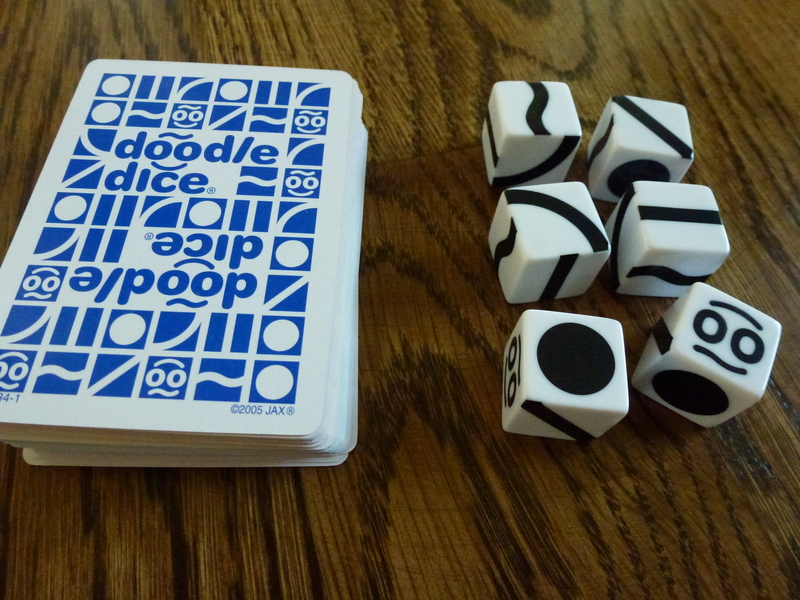 The orange cards contain easy doodles because it takes only one dice to match. 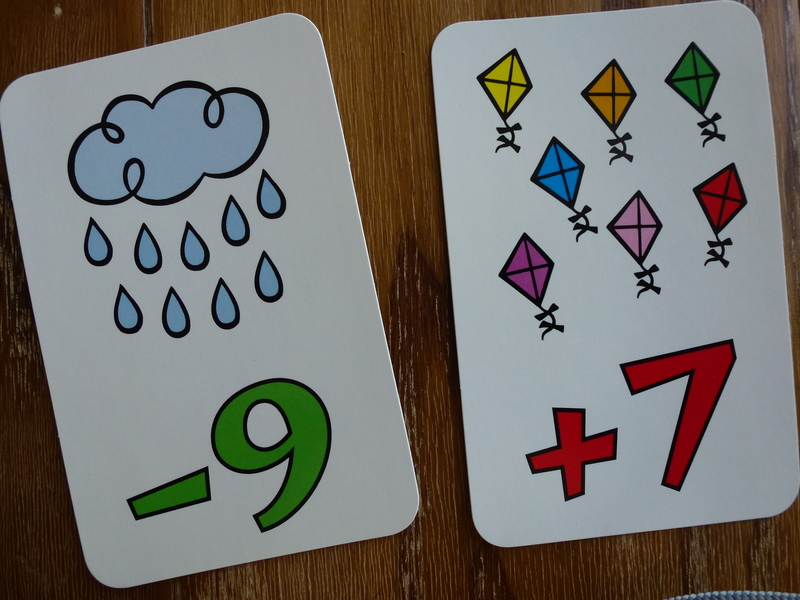 The red card has doodle pictures that require two dice matches; the yellow cards, three; the green cards, four; the blue cards, five; and the purple cards, all six. We opted to just roll the dice with our hands because the shaker cup was very noisy. But younger players with small hands might find the cup easier to use (ages 6-adult). 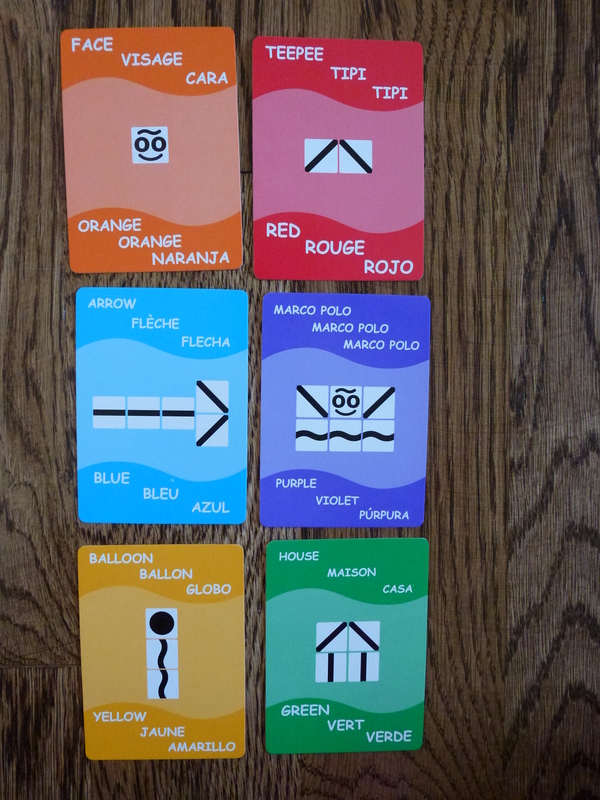 Cards contain the doodle word and card color in English, French, and Spanish. A nice game to incorporate into a foreign language class. It was easy to learn (complete instructions here) and super fun. It’s recommended for 2-6 players; I played with 2 and also 4 players and didn’t notice any difference in game play (I lost both times). Win or loose, I highly recommend this unique dice and card game from Jax! I received Doodle Dice™ from Jax to help facilitate the writing of an honest review. A positive review is not guaranteed, and all opinions are my own. No other compensation was received. Kings go in the corners. Play your cards solitaire style and extend your turn as long as you can. Can’t make a single play? Pay the pot. First to empty your hand? You win the pot…plus your opponents’ point chips for their unplayed cards! Reach 100 points and win the game! A fun version of the classic card game. It comes with a uniquely designed card deck, scoring chips and a plastic folding tray that serves as the centerpiece of the game keeping the cards neat. A game for 2-8 players ages 7 to adult. I think that six players are too many because it takes too long to play. Two players are fine but there might be several turns without being able to make a play. My opinion is that 4 players works best. This Jax game is easy to learn and fun to play. View the complete instructions here. Although the instructions say to equally distribute the chips among the players at the start of the game, this isn’t really necessary. A pile or two of chips that everyone can reach is fine. The chips in the centerpiece pot is what calculates the winner’s score. Truth be told, we found the chip scoring to be a bit silly and prefer the scoring method of the classic card game. It’s another great game from Jax that is small and easy to take on visits and/or travels. I received Kings in the Corner from Jax to help facilitate the writing of an honest review. A positive review is not guaranteed, and all opinions are my own. No other compensation was received.